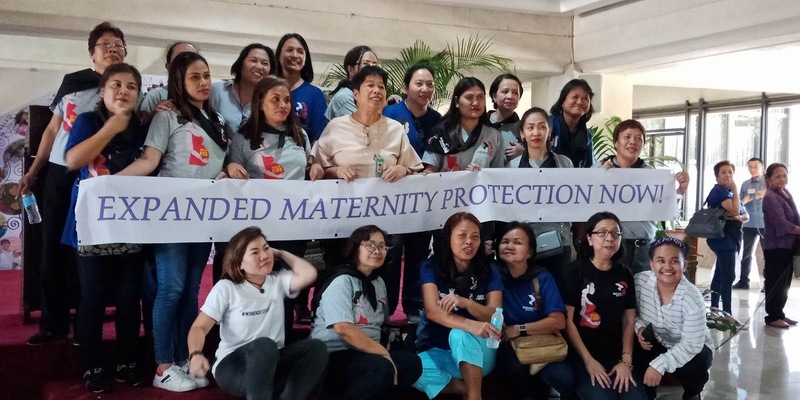 Women labor leaders are urging the leadership and members of House of Representatives to pass the Expanded Maternity Leave (EML) bill before the Women’s Month ends and Congress goes on recess on March 22. "It's about time that women workers enjoy this rightful benefit,” declared Judy Ann Miranda, Nagkaisa-Women spokesperson. Miranda, who is also the Secretary-General of Partido Manggagawa (PM), explained that the Philippines lags behind its ASEAN neighbors when it comes to protecting its mothers and their children. Vietnam provides 120-180 days of maternity leave depending on the working conditions and nature of work. Singapore provides 112 days while Cambodia, Indonesia and Thailand surpassed ours with 84 days of paid maternity leave. Likewise, a minimum of 98 days is prescribed under Convention 183 of the International Labor Organization (ILO). “Our current maternity leave law provides only for a 60-day leave which is inadequate and not even at par with international and regional standards,” said Miranda. The last time the number of paid maternity leave days was adjusted was in 1992. “The 100-day EML is therefore an improvement to say the least but women workers will never forget the fact that for over a quarter of a century, they were denied this necessary adjustment,” added Miranda. For Jessica de Ocampo of Workers4EML and Secretary-General of the Philip Morris Fortune Tobacco Corp. Labor Union (PMFTCLU), working mothers need to spend more TIME with their children to ensure that they receive optimum care. “Infants during the first six months of their lives should be fed with breast milk exclusively but the present law provides only for 60 days of maternity leave for normal delivery and 78 days for those who have undergone Caesarian operations. As it is, women workers are being asked to report back to work between two months or two and a half months from delivery,” said Ocampo. Reporting back to work that early, according to Ocampo, puts the health of mothers at risk and lessens the chances of working mothers to exclusively feed their children with breast milk. The proposed legislation also provides women with more relief in taking care of their babies in their first few months since even without an additional paternity leave, women can apportion some of their 100 days EML to their husband, partners or any other kin who would help them take care of their child. "Over the past decades, more and more women have entered the labor force. Yet as they take on more paid work, their reproductive and domestic role as primary care providers for their children and the rest of the family has not changed. This proposal is progressive as women will be able to share the responsibility of infant care with their significant other or relative,” said Ocampo. Furthermore, according to Annie Geron, President of the Public Services Labor Independent Confederation (PSLink), more than half of public sector employees are women and they are predominant in essential care and social services like health and education. “Amid the rising expectations and mounting needs of the public for women workforce in frontline services, the EML will now ensure the health and well being of our women workers to enable them to deliver quality public services. EML is long over due and it is a just social investment not only for women but also for the present and future generation,” said Geron. Finally, the Nagkaisa! Labor coalition expressed appreciation on the efforts of Congresswoman Bernadette Herrera Dy, chairperson of the Committee on Women and Gender Equality and for the authors of the said bill for their commitment to have the bill passed. The group now urges the House leadership to ensure its passage before they go into a Lenten break week.